Context Providers finally going to be published! 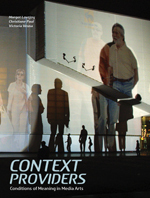 Context providers: : negotiating meaning in media arts, edited by Margot Lovejoy, Christiane Paul and myself is being published by Intellect press in the UK. It’s been almost 10 years since we first sat and talked about this !